The REV'IT Levante Jacket comes in both men and ladies sizing for the perfect fit and comfortable ride. For those who don’t want to choose between a waterproof and an air-mesh jacket, the Levante is a silver-bullet solution. This jacket, which comes fully equipped with CE-approved armor at shoulders and elbows, features a full mesh outer shell with an easily removable two-in-one fully waterproof thermal liner that can be stored in the back pocket when not in use. With the membrane removed the jacket can be upgraded with a Challenger cooling vest insert to take the edge off riding in hot weather. The Vest connector HV allows you to the upgrade your jacket with a HV vest that quickly and easily attaches. The highly visible EN471-certified vest offers enhanced safety. Ultra thin adjustment tab at cuff or leg. Thanks to laminating technology, the material of this UTA | tab is extra thin. This allows you to comfortably wear the sleeve of your jacket under the cuff of a glove, as many riders prefer to do. This technology can be found in most garments in the collection, and also as cuff tabs on the legs of textile trousers. The REV’IT! flexisnap makes it possible to adjust the collar circumference easily and personalize its fit to each rider. A jacket is often worn in more then one season, and the flexisnap makes it possible to adjust the collar within seconds. During winter a wider collar circumference accommodates combining the jacket with a balaclava or wind collar, while during summer, a wider circumference lets an all-important cooling wind into the collar. The flexisnap is available with 5 or 7 positions (XL). The back protector pocket in this REV'IT! 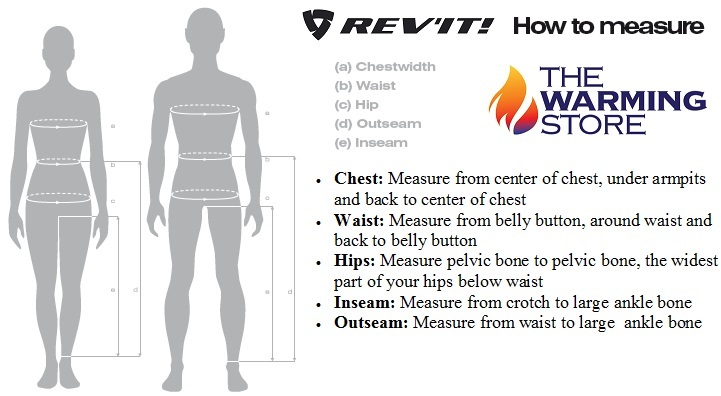 garment is tailor-made to accommodate the Seesoft CE-level 2 back protector insert Type RV - an easy upgrade to maximize safety.